On Your Marks, Get Set, OBSTACLE! It’s that time again Players and pals! 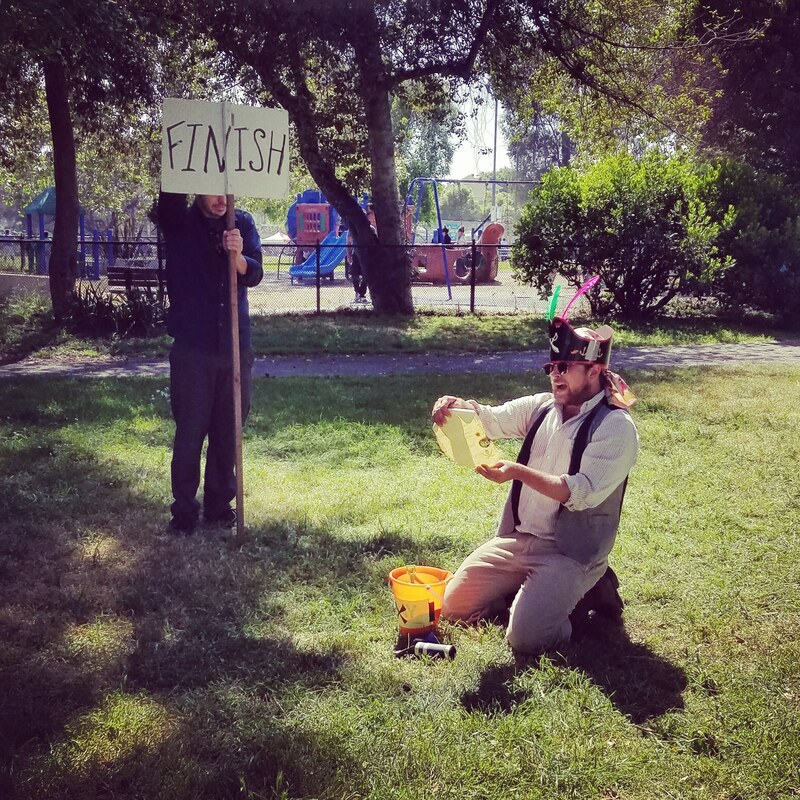 Announcing the Third Annual Particularly Obstinate Obstacle Course — P.O.O.C.#3! Our first foray into the P.O.O.C.! The P.O.O.C. 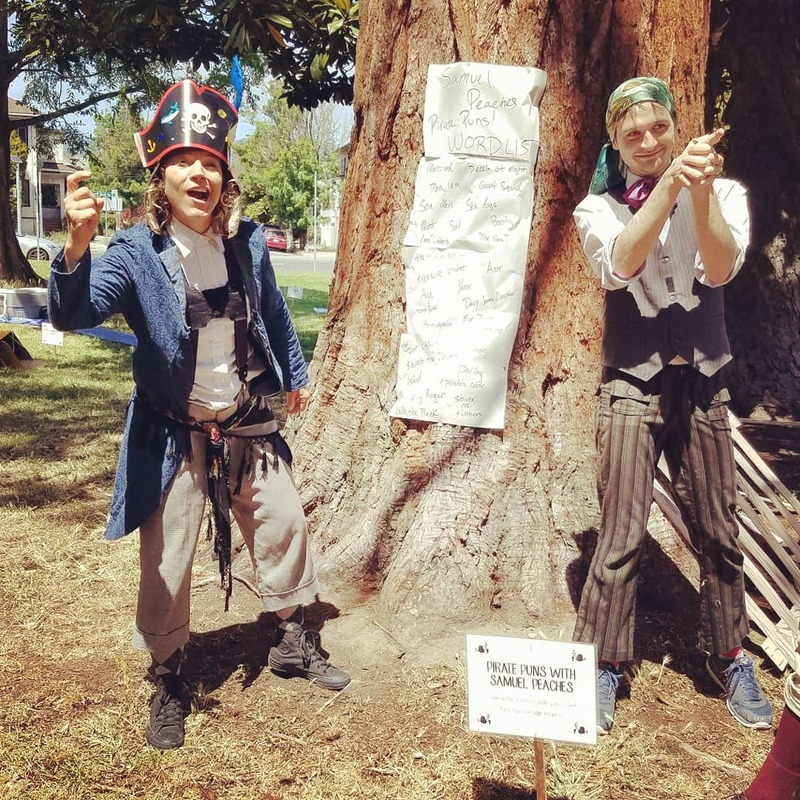 is our annual crowdFUNding event that helps raise the cash needed to send the Peripatetic Players around the Bay on their Summer Tour. 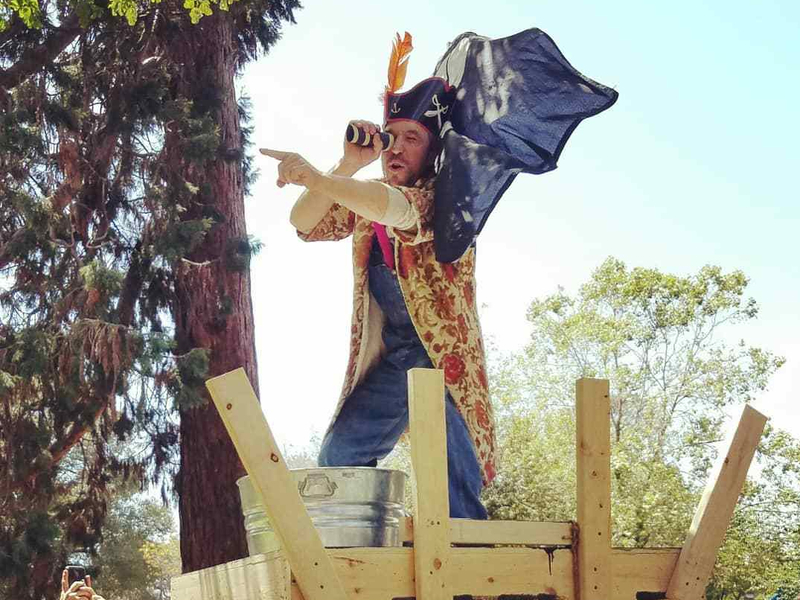 It’s also a lot of fun, so come on out to Mosswood Park on May 19 to cheer on the Players and witness Feats of Foolishness and Daring! 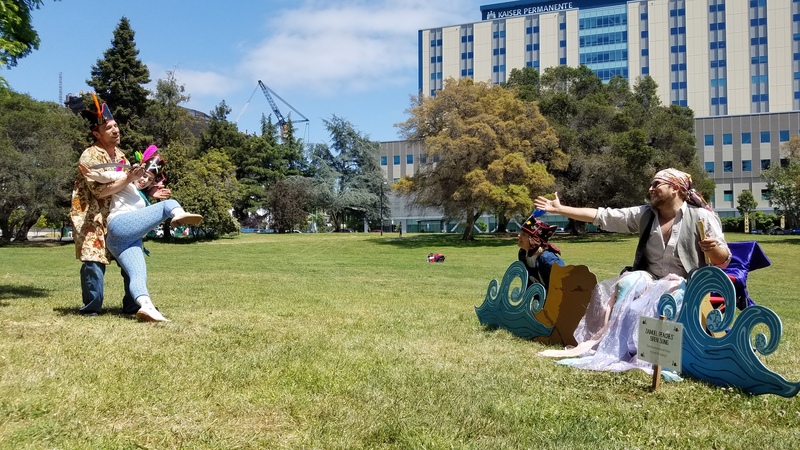 Not only will your cash bring delightful, free theatre to communities around the Bay, every dollar donated through July 15 will be matched 1:1 by a grant from the East Bay Fund for Artists of the East Bay Community Foundation. On average, if every person who sees our shows contributed $5, we’d cover our budget. Consider $5 your ticket price — what a deal! Of course not everyone who sees our shows can contribute — $10 covers your “ticket” plus a spot for someone else! Is our sunscreen budget for the summer. 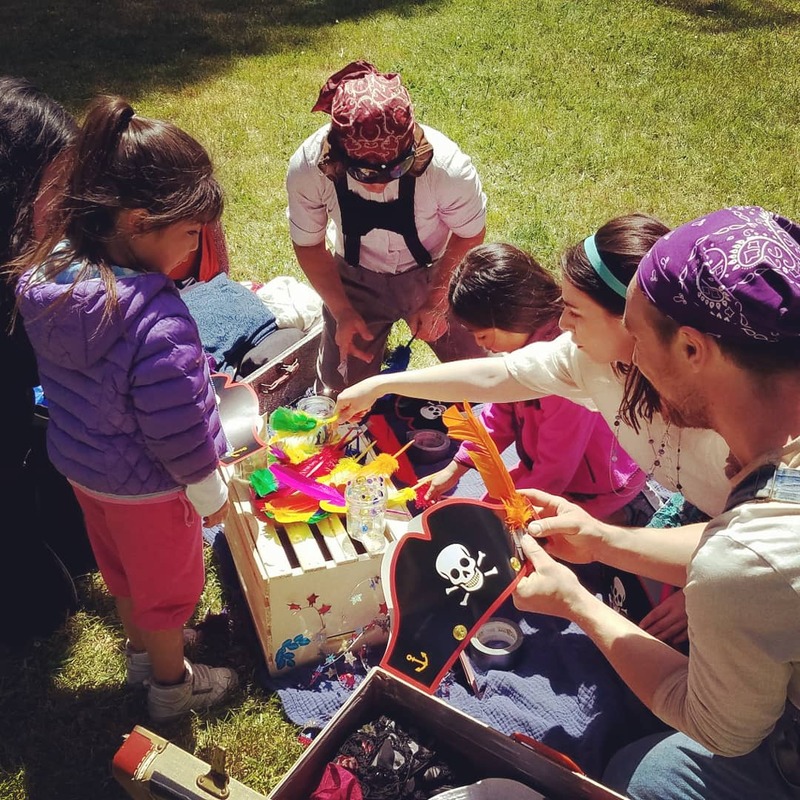 Helps us purchase materials to make audience participation supplies, like hats and vests! On our double-header days, this would go towards feeding the SPPPs — we need energy to to perform. Rents a pickup truck to haul FluxWagon, our folding mobile stage, for one weekend. Covers our General Liability Insurance for the Summer Tour. Insurance is really exciting! Just ask Meekins. 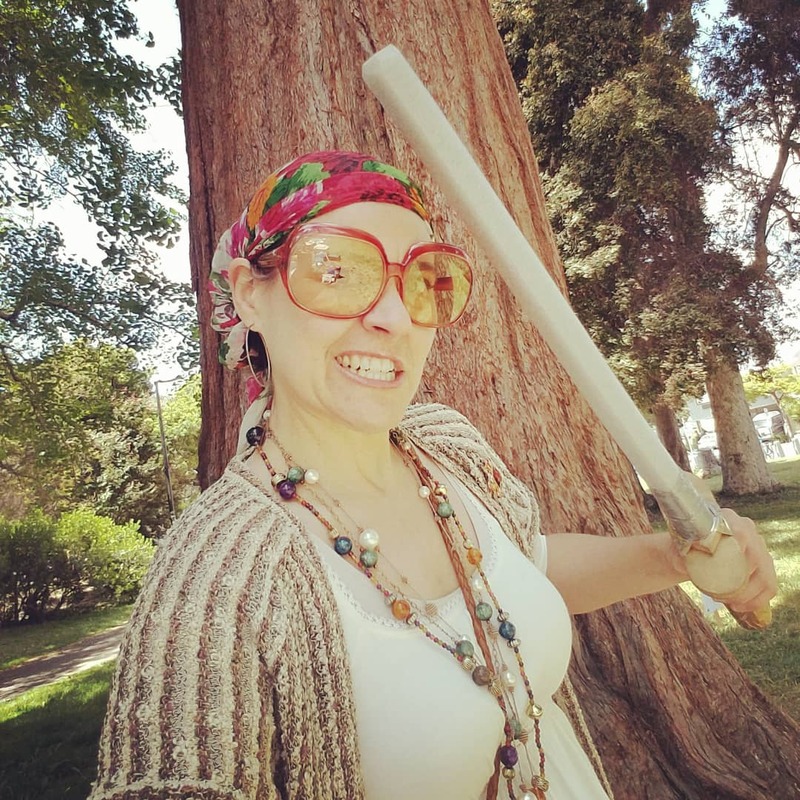 No matter what we spend it on, every dollar goes toward connecting people through the joyful shared experience and participatory fun of our interactive theatrical adventures… So what are you waiting for? Pledge a Peripatetic Player today! Thank you to Points West, the High Seas, and the Ends Of The Earth! Last week I sat down with Mr. Samuel Peaches himself to ask him about his creative process. My primary question? Samuel Nathaniel Xavier Peaches III esq. Writing a song is my Favorite Thing To Do. I often write such terrible and precious songs that I am unable to continue for my eyes weep rivers or my body reels so. I’ve had songs whisper to me from the driest darkest corners of the earth. Songs that have crushed my back as the sun falling from the sky. Songs that have splintered my core and like the Fearsome Phoenix streaking from the ashes I am Reborn! I have tasted starlight on my tongue, and felt the molten core of Earth almighty on my footsoles. You must turn yourself inside out and backside in to write a song. Upside Down and Rightside over Left. Only when you are bereft of every single faculty your mind and heart can offer, do your begin to realize your song just might be finished. But there are many more steps to take and paths to follow before peaking through the leaves: just ahead of you is that little moonlit harbour, sparkling reflections of silvers dance across the water, contrasted by the slowly bobbing amber glow of windows in the village, smoke ambling lazily up into our diamond fretted roof. Grazing clouds feast on the warm tropical air. Fireflies drift past hunting for love and a drink. In the purple distance your ship floats anchored. Dark sails hoisted, gaping portholes slowly lilting back and forth. You leave the black humming jungle and start down the grassy path, gravity filling your bones with buzzing we haven’t tasted since our youngest years. Your feet pick up speed on the hot earth as your crew lies snoring; dreaming and resting for the voyage that leaves at daybreak; the journey across the sea to lands unknown and wilds untamed. How do you write songs? It has been far too long since our last blog post, so I am here to give you all a special delight today! 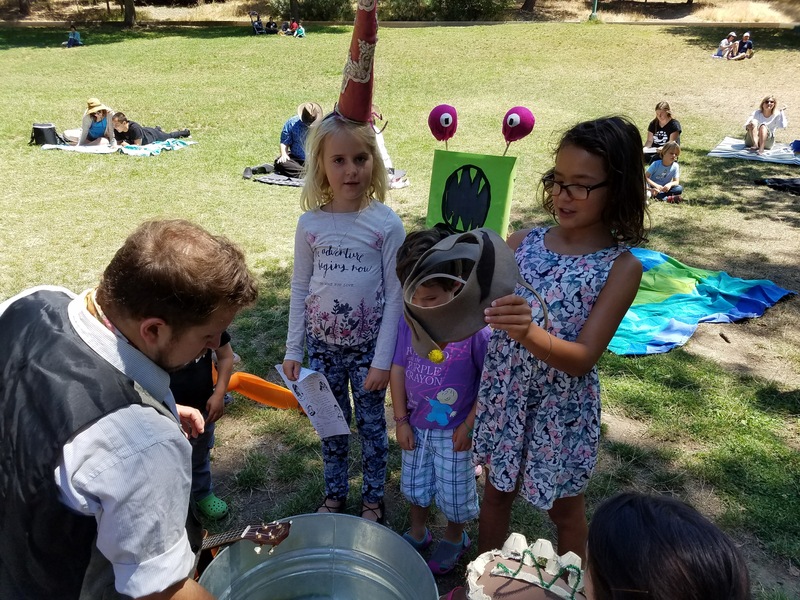 The SPPP’ers have been meeting every other week or so since the beginning of the year to …. play. We have playdates. 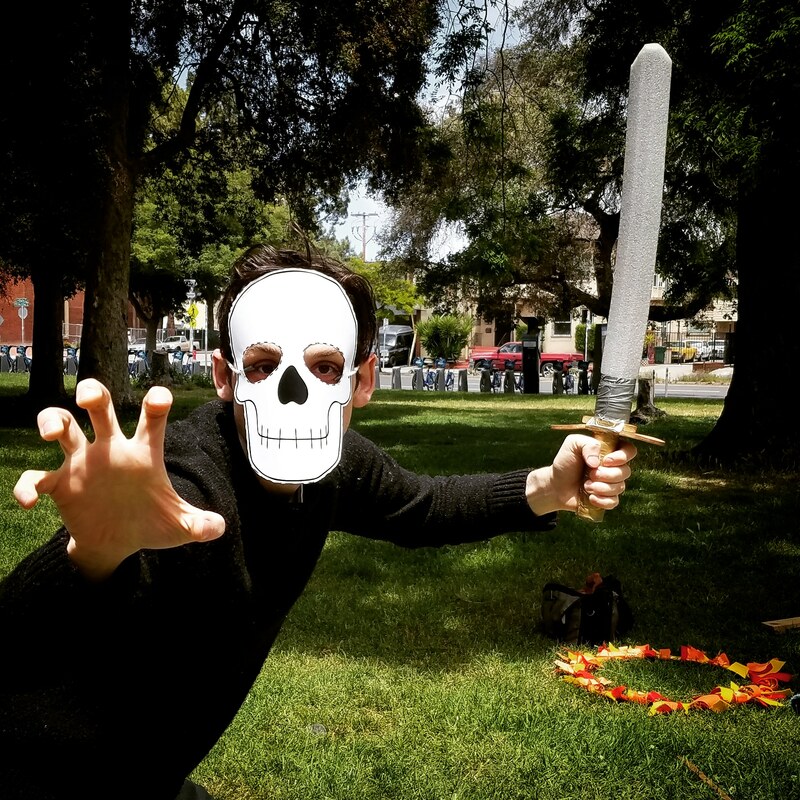 Sometimes cool things emerge, sometimes business-type things emerge, and then sometimes…. feats of greatness emerge. Like what happened on Sunday, February 25th 2018. Sunday saw Samuel Peaches, Thumper, Princess Gwen, Guy Hank, and Madame D. starting to make their adaption of J.R.R. Tolkien’s The Fellowship of the Ring entitled: A Lord of A Ring. The Hobbits Are Chased by Wraiths! I can honestly say that I don’t think the five of us have laughed so much in so long — we laughed so much we all started crying at one point! We can’t wait to keep creating things for you — if you have something you’d like to see, send us a message, and we will see what we can whip up for you! What a great 2017 tour! 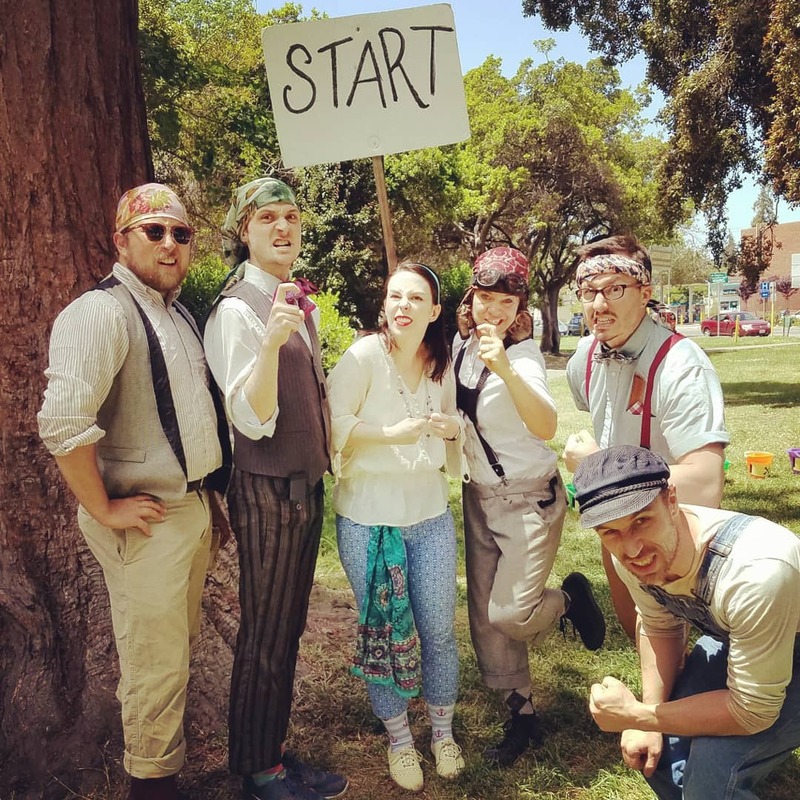 The Peripatetic Players took Shakespeare or Space Wars to Alameda, Oakland, San Francisco, Berkeley, Port Costa, Santa Clara, San Mateo, and hither and yon and back again for 12 performances this July and August. 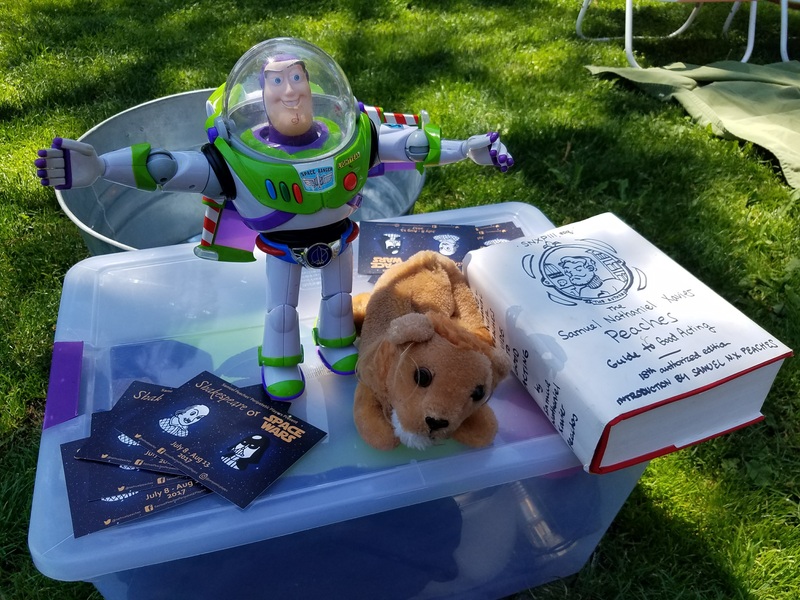 Shakespeare or Space Wars at Franklin Park, Alameda, on July 23, 2017. We performed for more than 1300 people, some of whom may have been actual Jedi knights, and about 20 dogs! For a while, a spaceman and a lion who had been separated from their families joined our merry band. We were a Staff Pick in the East Bay Express, were featured on ABC-7 News’s Hoodline segment, and chronicled in the Santa Clara Weekly. 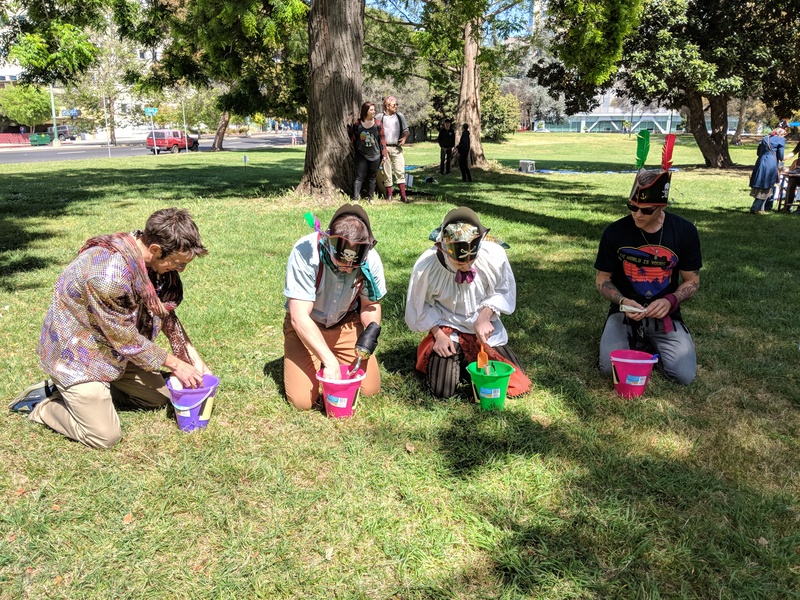 Here’s FluxWagon arriving at Precita Park in San Francisco! This monster never sleeps, but can give you a monster’s-eye view of the monster lair under the stage. …but we’ll have to wake up and move out soon, because FluxWagon will be hitting the road this October and November with a new play, Elixir of Life, produced by our very good friends at the theatre company Idiot String. 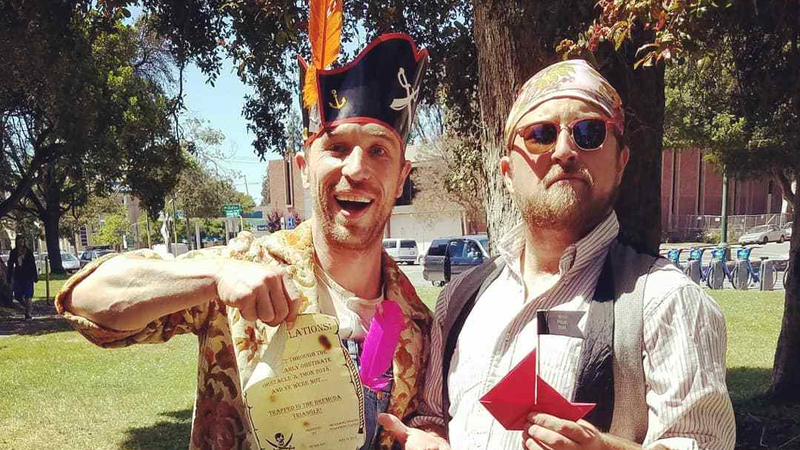 You may even recognize some of the actors as the Peripatetic Players’ friends and fans! Read more about Elixir of Life here. And stay tuned! The Players will be back throughout the year with lots of fun projects. 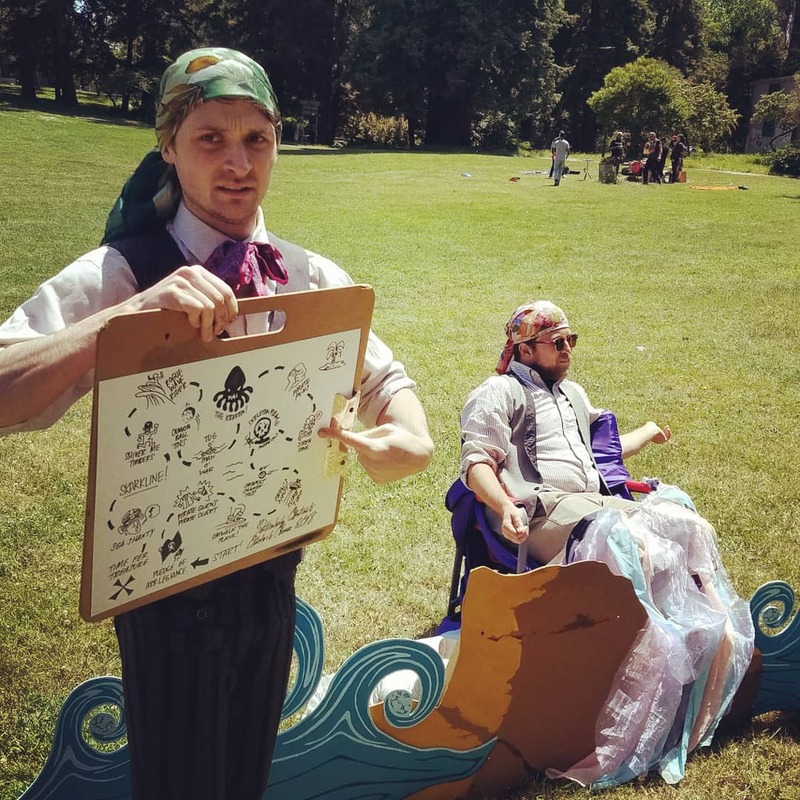 What sorts of creative projects do you think the Peripatetic Players should take on before our next summer tour? 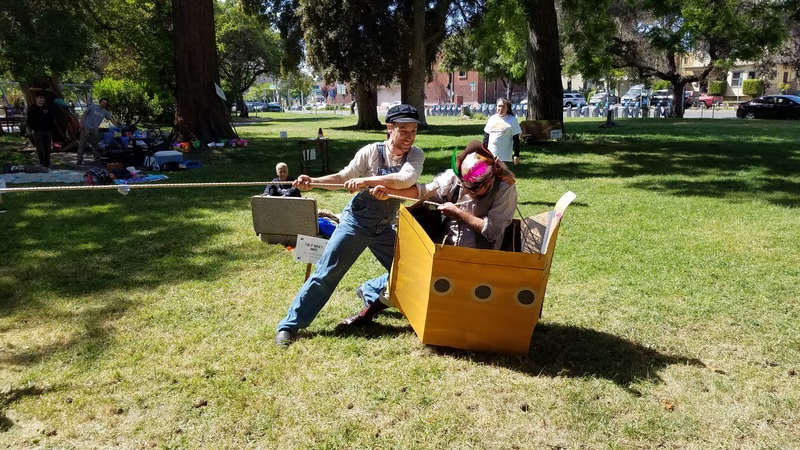 SHAKESPEARE OR SPACE WARS comes to Franklin Park, Alameda today at 1pm! Here are some behind-the-scenes shots from our tour thus far! And be sure to catch a show! Here’s the full schedule. 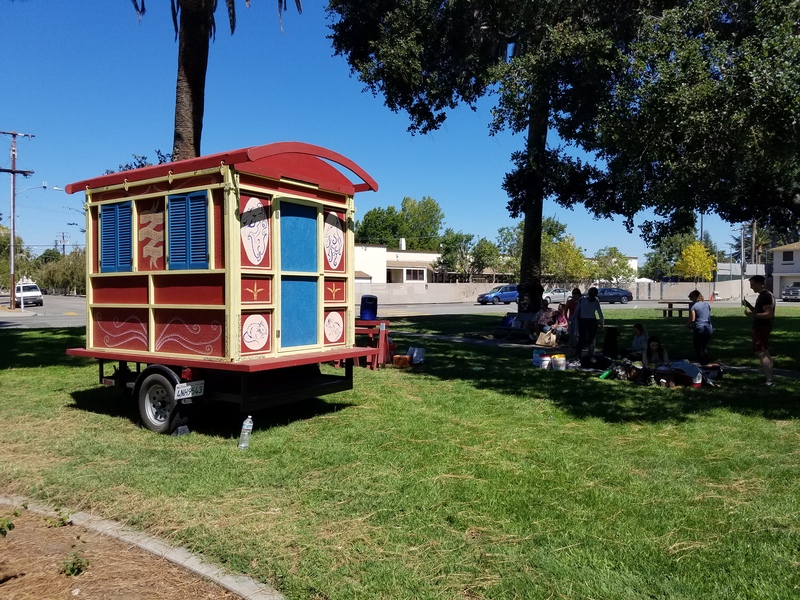 At each performance site, the Peripatetic Players set up FluxWagon, their folding mobile stage. Here’s a video of the Players in action this weekend in Port Costa! 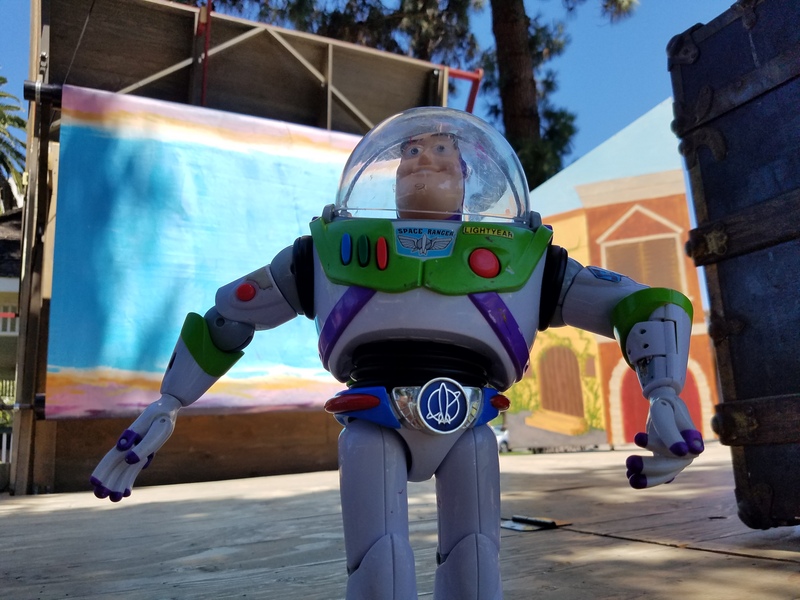 There’s 7 more chances to see the Player’s summer tour of SHAKESPEARE OR SPACE WARS! Our next two shows are July 22 in Santa Clara and July 23 in Alameda. Check out the full schedule here! Hear ye, hear ye! The venerable institutions 510Families, East Bay Express, and now Theatre Bay Area have all recommended Shakespeare or Space Wars! And we’ve got some fun pictures to show you! Aliens dancing during the Capulet Ball… at the Most Smiley Cantina! Romeo & Juliet… in space! Just jammin’ out before our Noe Valley show! Join us at any of our shows Saturdays and Sundays through Aug 13! 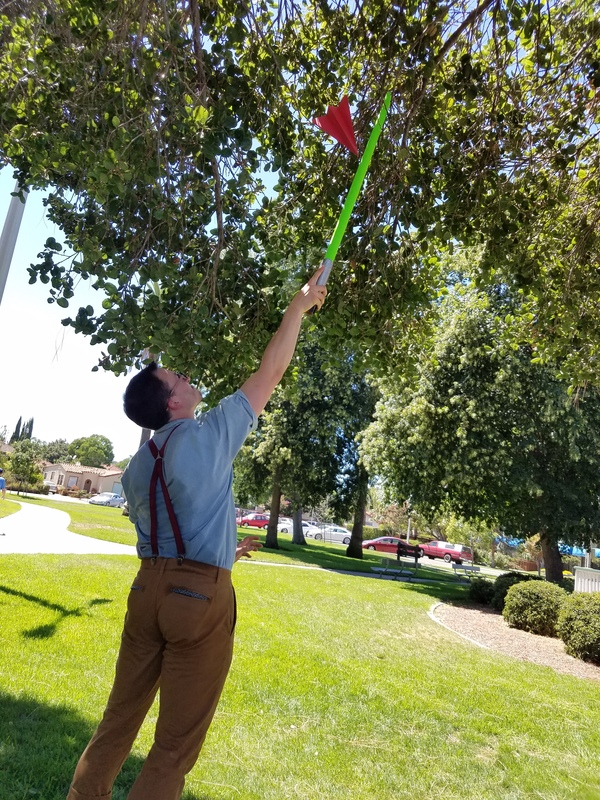 Click here for a schedule!